Reference number for this case: 11-oct-54-Montbazens. Thank you for including this reference number in any correspondence with me regarding this case. Aimé Michel indicates that at about 10:00 p.m., six inhabitants of the village of Montbazens, in the Aveyron, were working in the garage owned by Mr. Carrière, when the latter asked his son Bernard, aged 17, to hand him some tool. The boy had to pass near a window and there, he saw that the night was lightened up by a very strong gleam in the nearby field. The boy shouted that there is a fire at the house of the neighbour, Mr. Gimeno, and the six men, Mr. Carrière, Mr. Carrière's son, Mr. Gardelle, farmer, Mr. Nevoltry, farmer, Mr. Gineste, shoemaker, and Mr. Rosière, retired, "all men of good common sense, of strong nerves and not inclined to saucermania" all rushed out. The six men then discovered that an object had landed in the field behind Mr. Gimeno's house. The object was round, of about 4 meters in diameter, and irradiated a powerful red gleam. The witnesses stopped at the sight, hesitating. One of the witnesses, Mr. Gardelle, decided to get closer, but as soon as he walked a few steps, the craft took off without any noise, at a tremendous speed, and disappeared. The witnesses saw that Mr. Gardelle had put his hand at his forehead and started to fall down, so they run to help him. He was suffocating and shocked. When he recovered, the six men walked at the landing spot, but found no visible traces. The entire event lasted about two minutes. Aimé Michel specifies that the case has nothing to do with the one in Montbazin in the Hérault. The author notes that the Gardelle observation lasted 2 minutes. It was about 10 p.m. on 11 October, 1954 at a place called Montbazens (Aveyron), France. Six men were working in a garage workshop run by M Carriere, when he asked his son Bernard, a boy of 17, to bring him a tool. In order to do so the boy had to pass a window and in doing so he noticed a bright light which appeared to come from an adjacent field. Thinking it was a fire, he called to the others. Oct. 11, 1954, 10:00 P.M., Montbazens (France). A round craft, 4 m diameter, landed in a pasture. It gave off a powerful red light, took off with a formidable acceleration when witnesses (garage owner Mr. Carriere and son; Mr. Gardelle, farmer; Mr. Ginestre, shoemaker; and two others) came close to it. Mr. Gardelle felt "an electric shock." (Le Parisien, 13 oct 1954, Paris-Presse, 14 oct 1954) (60, 61; M 162). The author indicates that on October 11, 1954, in Monbazin in the Hérault, a luminous disc of 5 meters in diameter was seen on the ground. An "operator" was observed. The author then indicates that on October 11, 1954, at 10 o'clock in the morning, Montbazens in Aveyron, a round apparatus 4 meters in diameter lands in a pasture. He projects a powerful red light and flies away with a formidable acceleration when witnesses approach some. Among those cases, he indicates that on October 9, 1954, between Montaren and Uzes, France, a doctor and a farmer, plus six other persons saw a brilliant ellipsoidal object oscillating in the air at a short distance above the ground. 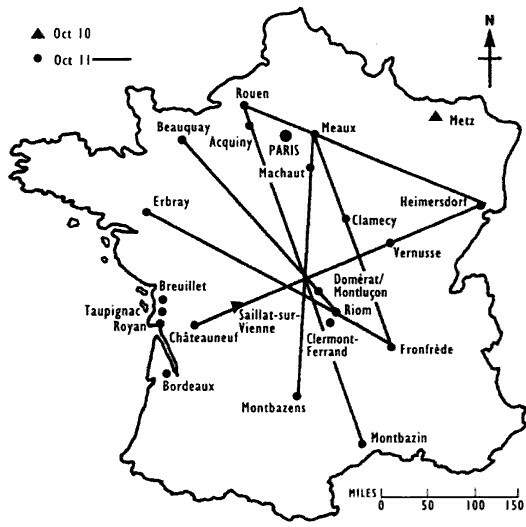 The to authors indicate that the case of October 11, 1954, in Montbazen, was a prank, exposed by the investigation of ufologists of the Lumières Dans La Nuit group. A round machine of 4 meters in diameter lands in a meadow. It released a powerful red light and took off with a formidable acceleration; it is at this time there that the witnesses, Mr. Carrière and his son, and Mr. Gineste, shoe-maker, and two other people approached. Mr. Gardelle "felt an electric discharge." The authors inform that a young ufologist, Mr. Canourgues, gave an account of what he discovered on the location with ufologists Chasseigne, and Lourenço and how he discovered that the case is cruelly disappointing. On their their arrival they indeed at once learned that all the story is only a well done prank. A soon as meeting Mr. Carrière, he immediately realized that the man is a prankster, and in the country, everyone considered him as a prankster. Mr. Carrière acknowledged in person the prank on a tone not leaving any possible doubt. Among the witnesses, several were in complicity, the others were fooled. Chasseigne and Lourenço whom assisted with the investigation came to the same conclusion. Car mechanic Carrière had used all the resources of his workshop so that the illusion was perfect. The authors of the book indicate that such examples show the little credit which can be granted to journalistic information as long as a serious investigation is not made on the location, and that obviously at the time when the saucer flap of 1954, nobody was prepared with such an multitude of sightings and to check them all at the time was quite simply impossible. The two authors indicate that in Montbazens in the Aveyron, on October 11, 1954 at 10 p.m., Mr. Carrière and six workmen observed a round apparatus posed on the ground emitting a powerful red light. The six witnesses were intrigued by a gleam when they discovered the apparatus posed on the ground. One of the six witnesses wanted to approach but he felt an "electric shock" when the apparatus took off without noise at a tremendous speed. The authors indicate that actually, a counter-investigation by L.D.L.N. published in "Mystérieuses Soucoupes Volantes" proved that Mr. Carrière, a mechanic, had benefitted from his hardware to fool his friends. The sources are listed as case 240 in the Vallée catalogue, Aimé Michel in "Mystérieux Objets Célestes" page 275 and "A Propos des Soucoupes Volantes" page 201; "Mystérieuses Soucoupes Volantes" by the LDLN Group with François Lagarde et Jacques Vallée, "INFO OVNI: Le Lapin et le Renard" by the Group 03100; Le Parisien for 10/13/1954 and Paris-Presse for 10/14/1954. hoax by a mechanic M. Carrière. Info-OVNI by group 03100 "Le Lapin et le Renard" N° . "OVNI" p. 667. It is Montbazens, the case of Montbazin (34) is [may] in reality be the hoax of Montbazens (Aveyron). Godelieve van Overmeire indicates that in 1954, on October 11, in France in Montbazens, a round machine 4 m in diameter lands in a meadow. It released a powerful red light and took off with a formidable acceleration when the witnesses Carrière, mechanic, Gardelle, farmer, Ginestre, Shoemaker, and two other people approached. Mr. Gardelle felt an electric shock. The source for this is indicated as Jacques Vallée: "Chronique des apparitions ET" - Denoël 1972 - Coll. J'AI LU - p. 277, 278). Godelieve van Overmeire adds that actually, an investigation by L.D.L.N. showed that the mechanic Carrière had used his hardware to fool several of his friends. The source for this is indicated as "M. FIGUET/ J.L. RUCHON: "Ovni, premier dossier complet..." Alain Lefeuvre pub. 1979, p. 146 and 667." Donald Johnson indicates that on October 11, 1954, at 8:00 p.m. in Montbazens, France a round craft, four meters in diameter, landed in a pasture. It gave off a powerful red light and took off with extreme acceleration when witnesses (garage owner Mr. Carriere and son; farmer Mr. Gardelle, shoemaker Mr. Ginestre, and two others) came close to it. Mr. Gardelle felt an electric shock. The sources are indicated as Aime Michel, Flying Saucers and the Straight Line Mystery; Jacques Vallee, Passport to Magonia: A Century of Landings, p. 226. Jérôme Jerome Beau indicates that on Monday, October 11, 1954, at 22:00 in Montbazens, France, "1 round machine, 4 m in diameter, lands in a meadow. It releases 1 powerful red light and takes off with a formidable acceleration when the witnesses (Mr. Carrière (mechanic) and its son, Mr. Gardelle (farmer), Mr. Ginestre (shoemaker) and 2 other people), approach. Mr. Gardelle feels an electric discharge." Jérôme Beau indicates that his sources are Le Parisien, October 13, 1954; Paris-Presse, October 14, 1954. Michel Padrines indicates that on Monday, October 11, 1954, at 22:00 in Montbazens, France, one round machine, 4 m in diameter, lands in a meadow. It releases 1 powerful red light and takes off with a formidable acceleration when the witnesses (Mr. Carrière, mechanic, and its son, Mr. Gardelle, farmer, Mr. Ginestre, shoemaker, and two other people), approach. Mr. Gardelle feels an electric discharge. Michel Padrines indicates that his sources are Le Parisien, October 13, 1954; Paris-Presse, October 14, 1954. Luc Chastan indicates that in Montbazens in the Aveyron on October 11, 1954 "Towards 22:00, six residents of the village worked in the garage of Mr. Carrière, mechanic, when the latter asked his son Bernard, 17-year-old, to pass a certain tool to him. The boy had to pass near a window and there, he saw that the night was lit by a very strong gleam in the neighboring meadow. The boy shouted that there is a fire at the neighbor's house, Mr. Gimeno, and the six men, Mr. Carrière, his son, Mr. Gardelle, a farmer, Mr. Nevoltry, farmer, Mr. Gineste, shoe-maker, and Mr. Rosière, pensioner, "all sensible men, of solid nerves and not very inclined to saucermania" all rushed outside." "The six men then discovered that an object had landed in the meadow behind Mr. Gimeno's house. The object was round, approximately 4 meters in diameter, and irradiated a powerful red gleam. The witnesses stopped at its sight, hesitating." "One of the witnesses, Mr. Gardelle, decided to go to see more closely, but as soon as he had walked a few steps, the machine took off without any noise, at an enormous speed, and disappeared. The witnesses saw that Mr. Gardelle had carried his hand to his face and had started to stagger, thus they ran to help him. He was suffocating and was commotionned. When he recovered, the six men went towards the place of the landing, but did not find any visible trace. The whole event lasted approximately two minutes." And: "Actually a hoax by the garage owner." Luc Chastan notes: "This is cas to be dismissed because : Masquerade of a third party". The sources are given as List of the Magonia cases by Jacques Vallée; Les OVNI vus de près by Gross Patrick ** http://ufologie.net; M.O.C. by Michel Aimé ** Arthaud 1958. The website indicates that on 11 October 1954 at 22:00 in Montbazens, France, the case was a prank. "A round craft, four meters diameter, landed in a pasture. It gave off a powerful red light, took off with a formidable acceleration when witnesses (garage owner Mr. Carriere and son; Mr. Gardelle, farmer; Mr. Ginestre, shoemaker; and two others) came close to it. Mr. Gardelle felt "an electric shock."" "An object was observed. Physiological effects were noted. One red ball, about 5 feet across, was observed by six male witnesses in a yard for two minutes." The sources are indicated as Michel, Aime, Flying Saucers and the Straight-Line Mystery, S. G. Phillips, New York, 1958; Bowen, Charles, The Humanoids: FSR Special Edition No. 1, FSR, London, 1966; Vallee, Jacques, Computerized Catalog (N = 3073); Vallee, Jacques, Challenge to Science: The UFO Enigma, Henry Regnery, Chicago, 1966; Vallee, Jacques, Preliminary Catalog (N = 500), (in JVallee01); Vallee, Jacques, A Century of Landings (N = 923), (in JVallee04), Chicago, 1969; Cramp, Leonard G., Piece for a Jig-Saw, Somerton, Isle of Wight, 1966; Schoenherr, Luis, Computerized Catalog (N = 3173); Hatch, Larry, internet data. *Oct. 11, 1954 - At 10:00 p.m. in Montbazens, Herault, France a round craft, four meters in diameter, landed in a pasture. It gave off a powerful red light and took off with extreme acceleration when witnesses (garage owner Mr. Carriere and son; farmer Mr. Gardelle, shoemaker Mr. Ginestre, and two others) came close to it. Mr. Gardelle felt an electric shock. (Sources: Aime Michel, Flying Saucers and the Straight Line Mystery, p. 162; Jacques Vallee, Passport to Magonia: A Century of Landings, p. 226, case # 240). [---] Article in the regional newspaper La Dépêche de Toulouse, Toulouse, France, October 13, 1954. [---] Article in the national newspaper Le Parisien, France, October 13, 1954. [---] Article in the national newspaper Paris-Presse, France, October 14, 1954. [---] "Piece for a Jig-Saw", book by Leonard G. Cramp, Somerton publishers, U-K., 1966. [am1] "A Propos des Soucoupes Volantes", book by Aimé Michel, reprint of "Mystérieux Objets Célestes", Planète publisher, France, page 201, 1967. [jv1] "Un Siècle d'Atterrissages", article by Jacques Vallée, Lumières Dans la Nuit, France, #43. [jv2] Summary by Jacques Vallée in "En Quête des Humanoïdes", book by Charles Bowen, French translation of "The Humanoids", J'ai Lu publisher, France, page 51, 1974. [---] "Le Lapin et le Renard", article in INFO OVNI, bulletin of the ufology group 03100, France, N.0. [gl1] "Face aux Extra-Terrestres", book by Charles Garreau and Raymond Lavier, Delarge publisher, J'ai Lu, France, page 223, 1975. [rs1] "Socorro Saucer - The Closest Encounter of Them All", book by Ray Stanford, Blueapple Books publishers, USA, 1976. [am1] "Mystérieux Objets Célestes", book by Aimé Michel, Seghers publisher, France, pages 218, 220, 1976. [rs1] "Socorro Saucer - The Closest Encounter of Them All", book by Ray Stanford, Fontana-Collins publishers, U-K., page 146, 1978. [fr1] "OVNI, Premier Dossier Complet des Rencontres Rapprochées en France", book by Michel Figuet and Jean Louis Ruchon, Alain Lefeuvre publisher, France, page 667, 1979. [fl1] "Mystérieuses Soucoupes Volantes", book by François Lagarde with Aimé Michel and Jacques Vallée and the LDLN ufology group, Albatros publisher, France, pp 144-145, 1976. [mf1] "Catalogue Francat des Rencontres Rapprochées en France - Listing 800", catalogue by Michel Figuet, France, 11082. [gc1] "UFOs and Anti-Gravity: Piece for a Jigsaw", book by Leonard G. Cramp, Adventures Unlimited Press publishers, U-K., page 298, 1997. [---] Larry Hatch, USA, circa 2002. [tg1] "1954 - 2004 - De la Grande Vague à la Commémoration", article by Thierry Gaulin, OVNI-Languedoc, France, 2004, sur www.studiovni.com/arttg02.htm. [mp1] "Générations UFO", book by Michel Padrines, self-published, France, page 125, December 2006. 1.1 Patrick Gross December 18, 2008 Additions [jb1]. 1.2 Patrick Gross December 20, 2008 Additions [mp1], [dj1], [ud1]. 1.3 Patrick Gross April 25, 2009 Addition [mc1]. 1.4 Patrick Gross March 7, 2010 Addition [gc1]. 1.5 Patrick Gross April 10, 2010 Addition [lc1]. 1.6 Patrick Gross June 28, 2010 Addition [jv5]. 1.7 Patrick Gross October 18, 2014 Addition [ni1]. 1.8 Patrick Gross February 21, 2017 Addition [ub1].